We carry a range of high quality laminate rolls and roll laminating film, including gloss laminating roll film, matte laminating roll film, and wide format roll film for all your laminating roll projects. Gloss laminating roll film is available in widths from 1.5 mil up to 10 mil. Lengths and widths are available from 9" to 27" wide and from 100' to 500' in length. Gloss laminating films are excellent quality laminate rolls that can be used for two-side laminating of printed documents. 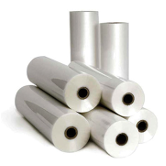 Matte laminating roll film is available in a wide variety of thicknesses and widths. This film has a matte surface to reduce reflection while still protecting your documents. Thicknesses available from 1.5 mil to 5 mil, widths from 18" to 38" wide, and lengths from 200' to 500'. Wide format roll film produced by DIGIKote® DIGIKote Laminating roll films are specially engineered for large format output. This wide format laminating film uses LIGHTFast technology, with UV inhibitors that protect your documents from harmful UV rays, which reduces fading of your documents. DIGIKote laminating films will enhance clarity by sealing at low temperatures, which helps preserve inks. Printed images remain bold, colorful and crisp for much longer than an uncoated image. 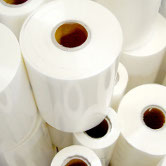 Please feel free to contact our knowledgeable staff for any of your roll laminating and pouch laminating projects. Feel free to browse our catalog of laminating machines, binding machines and other paper handling supplies.